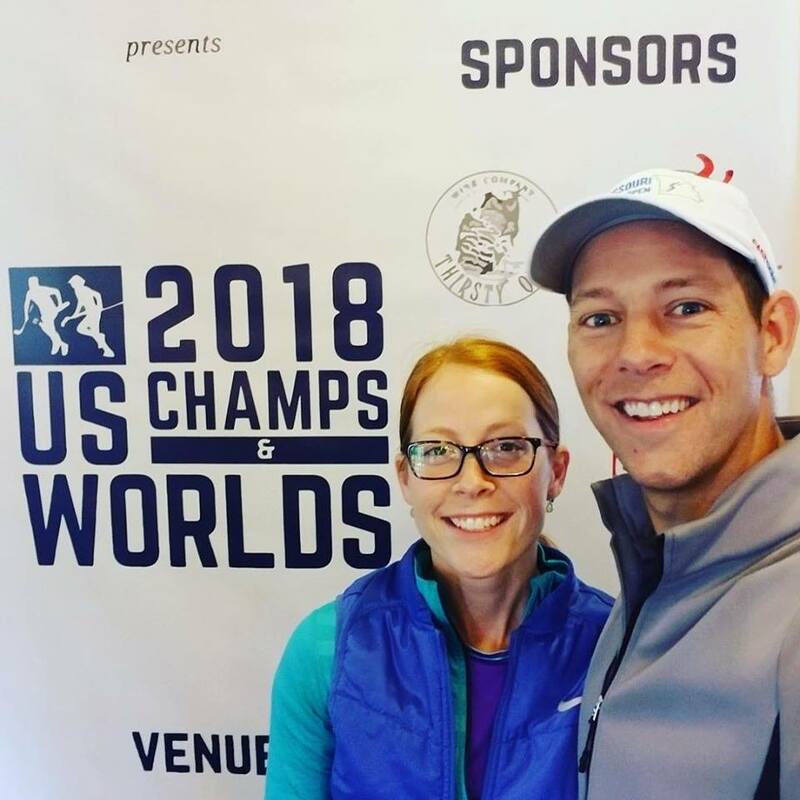 Garrett Holt is the Golf Pro at Horton Smith Golf Course and a Professional Speedgolfer who recently competed in the US Championships, World Championships, and World Cup—all held during a four-day span in Rome, NY and Verona, NY on Oct. 14-17. Speedgolf is an alternative form of golf that combines both running and golf. Participants run/jog in between each shot with the goal of finishing as fast as possible while still playing good golf. Speedgolf scores (SGS) are a combination of strokes and time, such that if a golfer shot 90 strokes in 60 minutes, they would have a SGS of 150. The top players in the world play 18 holes in 40-55 minutes and shoot 72-82….all while only using 4-6 clubs! How did you get involved in Speedgolf? How did you get involved in participating in the Championships? During a slow winter at Horton Smith, I was reading some golf industry magazines and I came across an article about Speedgolf. Being a golf professional and frequent runner, the concept caught my attention immediately. Two months later, a former golf professional and local runner, Shawn Moore, approached me about a fun form of golf called “Speedgolf.” It was such a weird coincidence that I figured it was a sign that I should really pursue this sport! Shortly thereafter, we teamed up to form Speedgolf Springfield, with weekly league nights at Rivercut Golf Course. Later that year, I got word of a Speedgolf World Championship to be held in Chicago. I inquired about qualifying requirements for it, and I was allowed to participate in the Elite Division composed of the best Speedgolfers in the world. They also had amateur age divisions for those wanting to participate in less competitive categories. It was a fun experience, even though I quickly realized that the guys and gals in this division were definitely a step or two above my abilities at that time! Since then, I’ve competed in as many state tournaments, US Championships, and World Championships as I’ve been able to attend. My preparation for these events revolves around being consistent with my running and fitness in the months leading up to the event and keeping the golf game sharp—normally doing these separate from each other. In the weeks leading up to each event, I incorporate more Speedgolf rounds into my weekly training to get used to the sport again and the feeling of having to pull off golf shots with an elevated heart rate. What attracted you to Speedgolf? My two biggest hobbies were golf and running, both of which require a significant time commitment, so when I found out I can do them both together in a fraction of the time, I was immediately sold on the idea! Further, I really enjoyed the challenge of the sport. It offered a new and novel way of playing a very traditional sport and I got to see myself improve at a new activity. For those looking to be competitive, there are lots of ways to be competitive. You could be a very fast runner and mediocre golfer, or a slower runner and great golfer and still compete! Do you actively monitor your heart rate while you’re playing? Golfing with an elevated heart rate can be difficult and definitely has a learning curve to it. Much like the Olympic Biathlon, Speedgolfers have to be as precise as possible and execute good form while our heart is beating at 160-180bpm. While I haven’t monitored all the heart rate data during practices or tournament rounds, I try to stay in a good range aerobically where I could still talk in sentences while running. I have noticed that I have gotten better at performing at a higher heart rate just from the simple practice of doing it so much. Tell us about the atmosphere on the course. The actual atmosphere was kind of crummy! It was in the 40-50’s and rainy for most of these events of this past week, so the weather atmosphere was not ideal! With that being said, the event atmosphere was electric. We had a DJ at each event with “walk-up” first tee music for each competitor and a fair number of spectators even though it wasn’t pleasant to stand outside. The Speedgolf community is really special. We had players from the US, Canada, Britain, France, Japan, Finland, New Zealand, and Australia and we were all cheering each other on and chatting about our rounds and various Speedgolf strategies. How did the Championship play out for you? Well it was a mixed bag of sorts. Recovering from some running injuries the last two months, expectations were a little lower. I performed well at the US Championships, shooting a 9 over par 81 in 52 minutes in 45-degree rain and on a rain soaked muddy golf course—this was a 14-point improvement over last year at the same course. Two days later I had a tough time at the World Championships where the golf game didn’t come as easily (89 in 62 minutes). A day after the World Championship was the World Cup, a brand new two-person team best-ball format representing your home country. My partner Jaacob Bowden and I played well, firing one of the lowest golf rounds of 74 in 74 minutes. We heard there was a crazy close finish at the World Championships…what happened there? Well, for the first time in our history, we have had the first and second place finishers differ by only one second!! I had mentioned how this sport is great because you can have elite golfers who are slower compete next to strong runners who can golf well. New Zealander Jaime Reid shot a SGS of 126:29 (golf score of 79 in 47:29) only to get edged out by Finland’s Mikko Rantanen who had a SGS of 126:28 (golf score of one-under par 71 in 55:28). What suggestions do you have for someone thinking about trying speedgolf? Are you sponsored for any of these events? I am sponsored by Srixon/Cleveland Golf so I use their golf clubs and balls—which are fantastic! I don’t yet have any other sponsors to help cover tournament entry fees or travel to these events, but I’d be willing to discuss that with any business that finds this sport as interesting as I do and wants to help me compete at the highest level! These championships marked the end of the 2018 Speedgolf season, so my goal is to get back into some running now that I am healthy again and be ready to go for upcoming spring events. I have seen steady improvement the past few years and am looking to continue that in 2019!